Denise Lee Branco’s Horse at the Corner Post tells the touching story of a girl-turned-woman’s 30-year relationship with her horse, Freedom. Branco’s true story includes situations which many horse owners face, including parting with a horse, believing it to be in good hands, and then finding out the situation changed. The author chronicles her journey in finding her equine partner again, and then her partnership that continued until her American Quarter Horse Freedom’s last day. Branco’s heartfelt words and vivid descriptions take the reader along for the journey, both spiritually and physically. I particularly liked the fact that she did not paint Freedom as the perfect horse at all times. Like many of us, he had his moments, which made him who he was. The family bonds weaved throughout, and certain rituals such as “praying to St. Anthony to recover things lost” added a very human touch and feel to this story. The conversational, melodic writing style makes the reader feel as if he or she is listening to the author in her own words. I also enjoyed the photographs, which gave the book a diary feeling, and a chance to get to know and see the characters at several stages in life. Along with her writing career, and as a continued tribute to her horse, Branco, an experienced horsewoman, has recognized horse rescues and helped with fundraising from Washington state to Maryland. Horse at the Corner Post readily shares Denise Lee Branco’s love of horses, her family, and life, and I highly recommend this well-written book, appropriate for all ages. 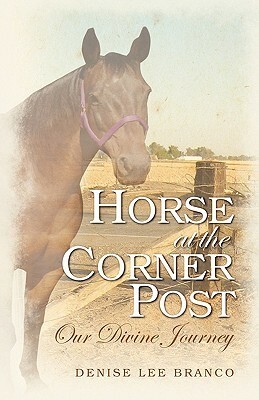 Sign into Goodreads to see if any of your friends have read Horse at the Corner Post.